(SCOTTSDALE) – Going once, going twice…SOLD! Art auctions are an exciting and savvy way to purchase an array of prized one-of-a-kind works of art. Once understood, bidding and buying at an auction is a surprisingly easy and fun way to begin building an art collection. Just in time for the 2015 Larsen Art Auction, Larsen Gallery is offering a 101 Guide to Bidding and Securing that one-of-a-kind work of art. The Larsen Art Auction will be held on Saturday, October 24th beginning at 10:00 a.m. at WestWorld of Scottsdale. 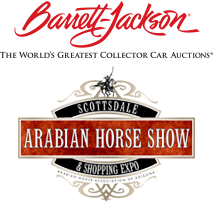 The auction is part of the Bentley Scottsdale Polo Championships: Horses & Horsepower and is FREE with a general admission ticket to The Polo Party, but registration with the Larsen Art Auction is required to bid. The auction catalogue is where prospective bidders can see the estimates on each lot for sale. This provides them with an important preliminary guide to the value of each piece. Larsen also welcomes registered bidders to come view the artwork at Larsen Gallery in Old Town Scottsdale, from October 1st-21st, where the gallery is happy to answer any questions. Next up, registering to bid. All participants are encouraged to register prior to the day of the event. Registering to bid entails reading the Terms and Conditions of Sale of the auction and completing a simple form. The Terms and Conditions of Sale provide important information such as the buyer’s premium, disclaimers, payment policies and guidelines for shipping and picking up artwork. Registered bidders will also receive an invitation to attend a private VIP Viewing Party ahead the auction. Register to bid now at larsenartauction.com. The day of the auction has arrived! With the Auction starting at 11:00 a.m. Larsen recommends arriving early in order to get all settled in before the fun begins. To place a bid, simply raise that paddle high until acknowledged by the auctioneer or his associates (“ringmen”). When a lot is sold, the auctioneer will strike his hammer stating the winning bid amount and the paddle number of the winning bidder! The Larsen Art Auction is always excited to welcome new spectators and buyers to its annual auction. Participation in the auction can be both a fun and memorable experience for all who attend! The Larsen Gallery is located at 3705 N Bishop Lane in Scottsdale. To get more information or to register to bid for the 2015 Larsen Art Auction please visit the auction’s website atlarsenartauction.com or contact the gallery at 480-941-0900.